Available as free-lance guitarist and band-leader. Experience in Jazz, Country, Rock and Blues. Ralf Buschmeyer’s chameleon abilities on the guitar mean that you could see him on any number of stages playing any number of styles of music. Born in Ontario, Ralf was drawn to music by the Blues and R&B stylings of Ray Charles, Eric Clapton and Booker T & the MGs. He picked up his first guitar at the age of 13 and shortly afterwards got his first live experience playing hard rock in Southern Ontario club bands. 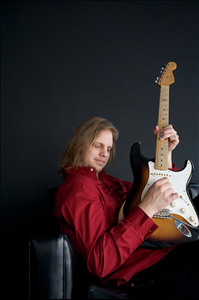 Dedicated to becoming a fully-rounded musician, Ralf took up studies at Hamilton’s Mohawk College where he studied weekly for 3 years with Toronto jazz great Lorne Lofsky. During this time he served as musical director and composer for Rogers Cable tv show ‘The Metal Mike Show’. Fate took Ralf touring the country with country acts for 3 years following college where he found a home in Calgary, Alberta. In 1998 Ralf became an alumni of the Banff Center For The Arts Jazz Workshop. He is currently co-leader of the Contemporary-jazz quartet Terrain, co-leader of the Bebop-jazz ensemble Manic Thematic Trio, faculty for Mount Royal College’s Jazz Diploma Program and a popular choice as free-lance guitarist for live engagements, recordings and as a composer-for-hire. In 2004 Ralf won the TD Canada Trust Jazz Festival Writers Commision Award and his collaborative effort with Richie Pollack ‘Stew’ earned them a WCMA nomination. Ralf's EST 1968 band represented Alberta at the 2010 Vancouver Olympics. He has been featured in Guitar Player Magazine and his 'Renewal' was positively reviewed in Blues Review Magazine. CDs 'EST 1968' and 'Renewal' earned several nominations from the Hamilton Music Awards including Best Instrumental Recording, Best Blues Recording and Best Guitarist. The 2012 release 'Jazzspeak' features Ralf with Jazz greats from across Canada and won Best Instrumemtal Recording for the 2012 Hamilton Music awards. Ralf is married to noted singer/song-writer/pianist Corinne Plomish and a proud father of 2 children and 2 dogs. Live performance credits include: PJ Perry, Ingrid Jensen, Eric Marienthal, Bobby Shew, Peter Appleyard, Frank Mantooth, Guido Basso, Ralph Bowen, Amy Sky, The Platters, The Swinging Bovines, Johnny Tilotsen, Johanna Silanpaa, Jack Semple, Hugh Fraser, Phil Nimmons, Curtis Grambo, TR3.